For a friend’s birthday bash last Friday, I had to come up with a Mexican recipe for the “Cinco de Mayo” theme she decided upon. For the record, Cinco de Mayo commemorates Mexico’s victory over the French during the Battle of Puebla in 1862. I debated making my usual guacamole (what can I say, I’m a girl who loves her classics! 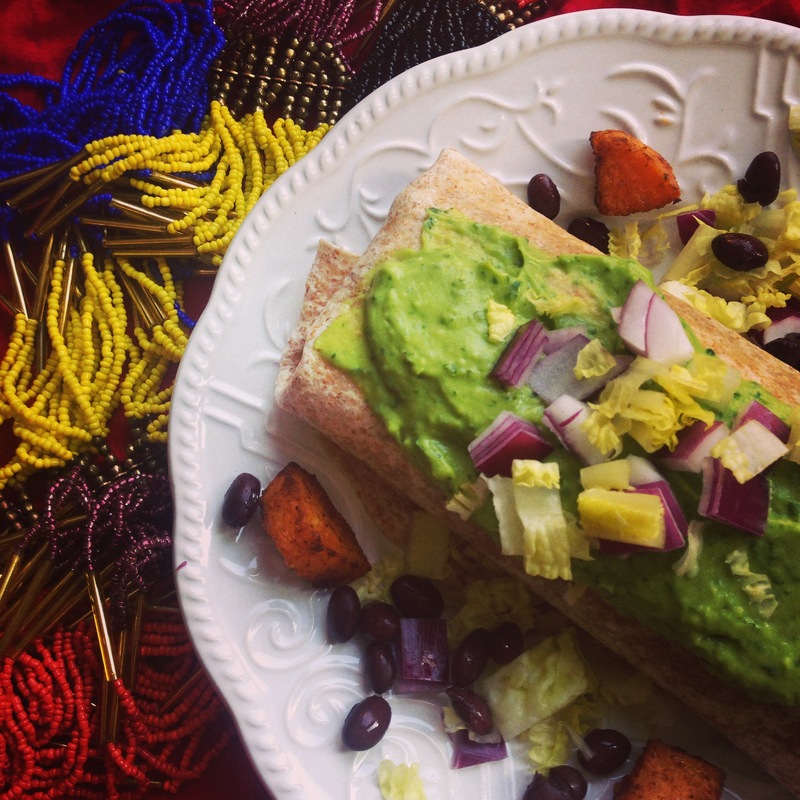 ), but my festive spirit went for a recipe I’d never made (dare I say I’m bold that way) – sweet potato and black bean burritos. The idea actually came to me after some fun taste testing at Tejano’s in St-Henri, Montreal (http://www.tejanobbqburrito.com/). The burritos there are actually the size of your head, you guys. And their vegetarian chilli burrito is killer. As tastebud-tickling as these were, homemade is always better (that’s my motto). 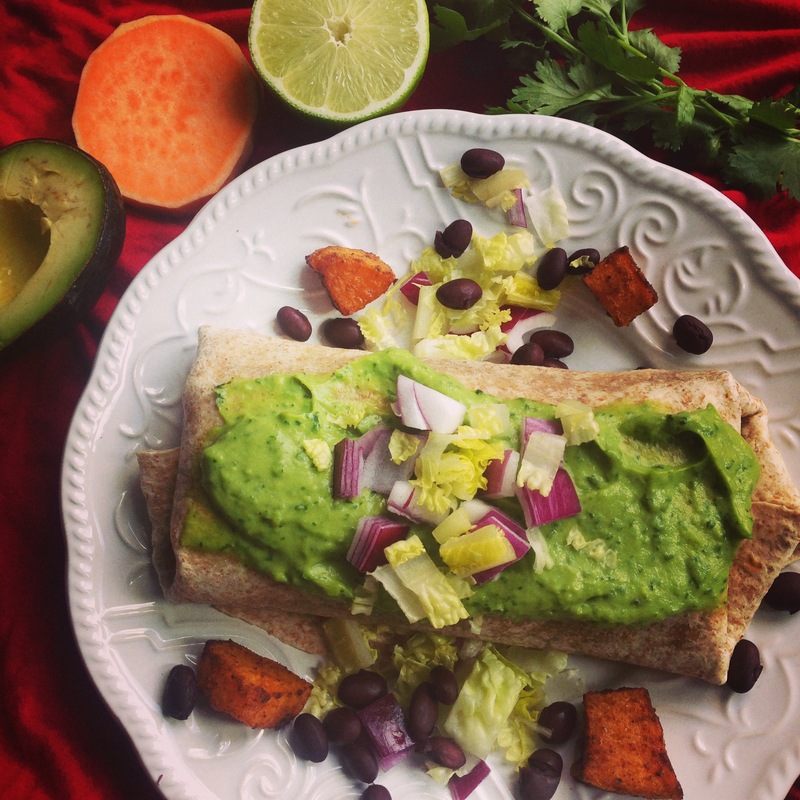 Thus, I decided to reproduce the latin flavour and make some healthy burritos both the vegetarians and meat-lovers attending the pow wow could appreciate (perhaps also to aid in balancing out the less healthy margaritas, micheladas, etc.). I wanted to make something healthy (no surprise there) without skimping out on the flavour. The whole entire dinner shebang came together beautifully. And though there was no piñata, the fiesta was a huge success. Sweet potatoes contain beta-carotene (carotene from the delta beta theta sorority – or not 🙂 ), which can help prevent certain cancers as well as age-related macular degeneration. This very beta-carotene is made more bioavailable (easily absorbed by our human bodies) through cooking (much like cooking tomatoes, as is explained in this post). Black beans: aside from being inexpensive, this type of bean contains anthocyanins, a type of antioxidant that protects against cancer. Spices: few people know that herbs and spices represent a great source of antioxidants. Plus, when it comes to spicy food, you generally tend to eat smaller portions. So that’s definitely a bonus when you’re attending a buffet-style potluck. 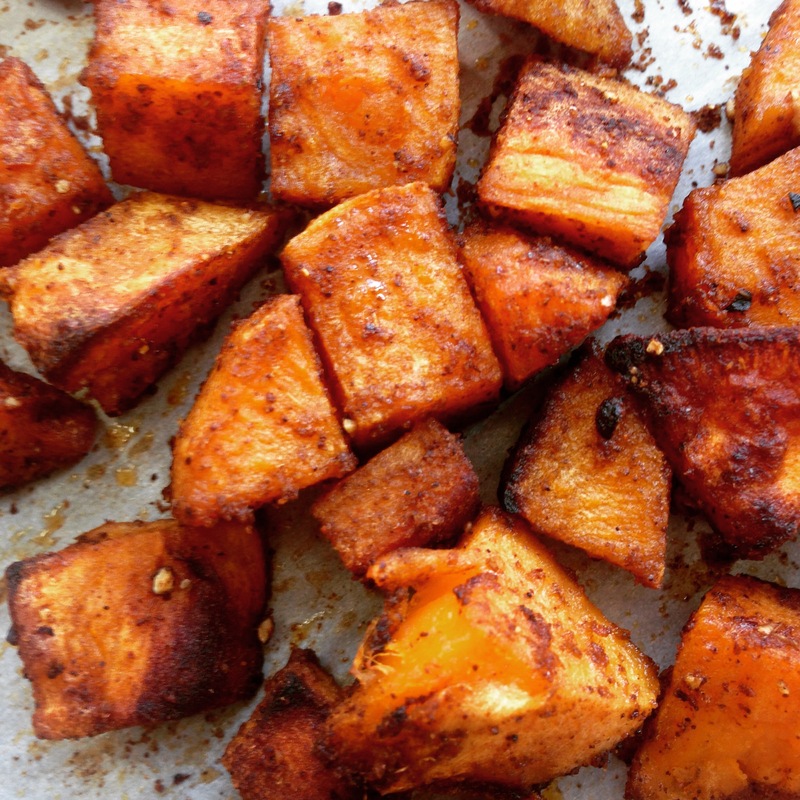 Toss the sweet potato cubes in the EVOO, cumin, chipotle powder and cayenne and bake for about 30 minutes or until golden and crispy. While you are cooking the sweet potatoes, blend all avocado sauce ingredients in a food processor or powerful blender. Once your potato “cubes” are ready, mix them with the red and green bell peppers, black beans, nutritional yeast, soy sauce, salt and pepper in a large bowl. Fairly distribute the mixture onto your 6 burritos. Roll. Top with nutritional yeast and pop into the oven for 5-10 minutes until tortillas are desired crispiness. Add the toppings that you fancy. I highly suggest dunking the burritos in guacamole before slam dunking them into your mouth. Nota bene: The components of this burrito are great on their own as well (read: in a deconstructed bowl). 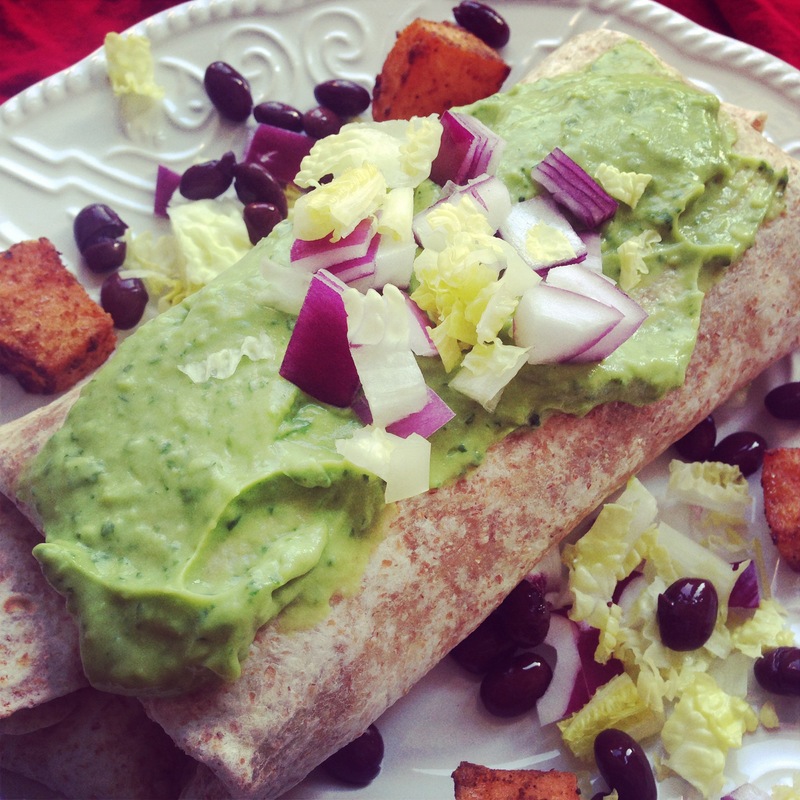 Vegetarian burritos in all their glory. Sorry/not sorry for your tummy growling as you view this picture.